I'm back to share another month of grocery expenses! I've decided I won't do this every single month in 2016... that's a bit much. But I will continue to track expenses and share an update post every few months. 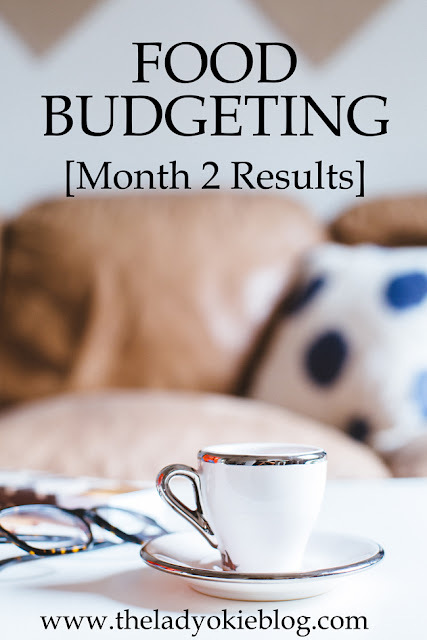 In case you missed the beginning, I suggest you read this post on How We Budget For Food and this post, which talks about what we spent in February and shares 4 tips for keeping your grocery budget costs down. I told you that our average spending in 2015 was $277 on grocery and $80 on lunch and that I wanted to see if I could cut that average down in 2016. I don't consider that number a fail or a success. I didn't spend more than our regular average, but obviously I didn't spend less either. I find it too funny that when I don't intentionally focus on spending less, I spend almost exactly the same amount every month. I guess that means we have our food system down to an art. Admittedly, I was busy last month and didn't focus on following my 4 grocery store tips as much as I did in February. I also had used up all of our food in February and had a few large trips to stock back up. And there may have been, ahem, a few last-minute purchases off the list for ice cream and such. This month I want to do better! Since last month's update I have become crazy app lady with THREE rebate apps. Every little bit adds up, people. I hope those of you who downloaded the Ibotta app are enjoying it! If you haven't yet, I really think you will love it. So even though I spent almost the same as my average, I ended up in the positive because of the rebates I got, which is exciting! This month I am trying to get our overall number down again, and I will check back in a few months with a report. How are you doing on your grocery spending this year? Do you use any rebate/coupon apps I should try out? Check out all my posts in the "How We Budget" series! Just signed up with your Ibotta code :) You don't even want to know how much our groceries are every month. It is out of control!!! Hopefully the Ibotta app will set off some of our costs. I wish I would have downloaded it yesterday, I see five things I bought at Target on there! Next week!! Thanks! I'm amazed at how little you spend on groceries. I spend about $100 more per month on just one person! Impressive. Great job! I enjoy your updates so I'm glad you'll keep us posted throughout the year, however often. Your last post about this really inspired me to get back on track with a better meal plan/budget each month and last week we did really good to kick off April- so thank you! :) I also started using Ibotta and Checkout 51 again... both apps I've had previously but got lazy and forgot all about. You're doing great! We're working on meal planning and budgeting too so your tips are great! Hey, doing the exact same as your average from last year isn't bad! Because obviously it wasn't a huge number to start with anyway! I definitely notice the biggest difference when I take time to shop at Aldi first to pick up my staples before going elsewhere. I did that last week - go me. And today I didn't. In fact today I just went straight to Sprouts (similar to Whole Foods, but smaller and not quite as expensive) so I spent more than normal anyway, ha! Sometimes the convenience of just one store is worth it and today was one of those days! okay, you've convinced me! i just downloaded the ibotta app. i am curious to see how much i get back in rebates! I've heard so many great things about Ibotta and am going to sign up now! Finally! I used to also use Shopkick - you can basically get "points" for just walking into a place/store, and end up with gift cards! Its' pretty neat - sure it may take time, but like you said, every little bit adds up and helps! :) I love these posts of yours!! Thanks for sharing, its super inspiring! I love Ibotta! Going to check out some of the others now! I've got to download MobiSave and Ibotta - if I ever get my phone back from getting repaired, that is! I love those budget posts. I signed up for ibotta, and referred a friend, so I'm already over $20 there! I don't like that I can't claim my regular grocery stuff there, since it's store specific and my little grocery store isn't on the app. But, I do like that I can double up my Walmart savings with Walmart's Savings Catcher, ibotta, and sometimes even Checkout 51 if I do end up buying some groceries at Walmart. also - i love this series - helps me remember to stay on top of my food budget. It's always those big stock-up-on-everything-at-the-same time trips that are a little hard on the budget momentarily, but they're so much more efficient than constant small trips--that's why I prefer the big ones! Hooray for Ibotta! I love that app. AND I need to start using it again more. I just haven't been to the store in a while. I think $270 is a pretty darn good number. Does that include R's food too? Also, can you imagine a food budget if you had a teenage boy? HA! It'd be double.